Április 17-én lezárult az a pályázati folyamat, amelynek során a Holokauszt Emlékközpont, az Oktatáskutató és Fejlesztő Intézet és a USC Soá Intézet együttműködésében középiskolai tanárok és tanárcsoportok készítettek multimédiás tananyagokat a Soá Intézet Vizuális Történelmi Archívumában (VHA) található magyar nyelvű interjúk felhasználásával. A 2009 szeptemberében kiírt felhívásra húsz pályázat érkezett, melyek közül a bíráló bizottság kilenc pályázót választott ki, ők kaptak lehetőséget arra, hogy tananyagot dolgozzanak ki. A konzultációk során a pályázók megismerkedtek a Közép-európai Egyetem könyvtárában hozzáférhető Archívum használatával, illetve a Holokauszt Emlékközpont és az Oktatáskutató és Fejlesztő Intézet szakemberei szakmai-módszertani felkészítése után láthattak neki pályázati anyaguk–az egyes tanórák, foglalkozástervek–kidolgozásának. 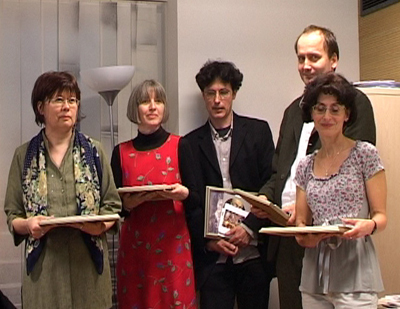 The first phase of the program in which educator teams developed multimedia lessons from the Hungarian language testimonies of the Institute’s Visual History Archive ended on April 17, 2010, with an official ceremony at the Holocaust Memorial Center in Budapest. 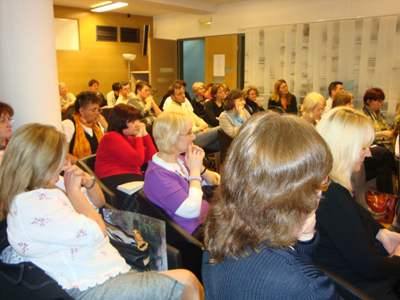 The program was based on a three-way partnership between the USC Shoah Foundation Institute, the Holocaust Memorial Center, and the Educational Research and Development Institute (OFI) of the Hungarian Ministry of Education. This first phase of this educational program consisted of two parts: First, the Institute’s partners issued a call for educators to participate in the development of educational materials, which resulted in 20 applicants from around the country. From these applicants, an advisory board chose nine educator teams, who developed lessons based on testimonies. 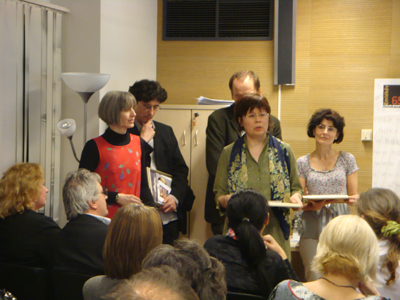 The ceremony on April 17 honored the best lessons, based on the evaluation of the board. 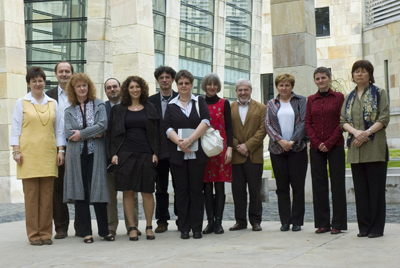 The first phase of the program in which educator teams developed multimedia lessons from the Hungarian-language testimonies of the Institute’s Visual History Archive ended on April 17, 2010 with an official ceremony at the Holocaust Memorial Center in Budapest. 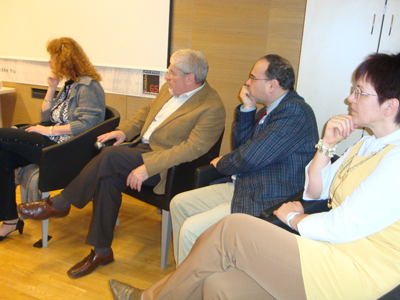 The program was based on a three-way partnership between the USC Shoah Foundation Institute, the Holocaust Memorial Center and the Educational Research and Development Institute (OFI) of the Hungarian Ministry of Education. This first phase of this educational program consisted of two parts: first, the Institute’s partners issued a call for educators to participate in the development of educational materials, which resulted in 20 applicants from around the country. From these applicants, an advisory board chose nine educator teams, who developed lessons based on testimonies. 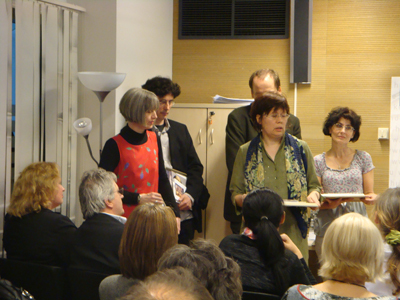 The ceremony on 17 April honored the best lessons, based on the evaluation of the board. The board’s task was not easy: all nine lessons covered important topics. After thorough deliberation, the board decided to award the authors of three outstanding lessons and even decided to award one more team a special prize. Zita Gonda and József Molnár (ELTE Trefort Ágoston High School, Budapest) for their works entitled The Doll and The Suitcase, two thematic lessons which incorporate testimony clips from 6 different testimonies of Holocaust survivors, as well as photos from the VHA . The developed lessons incorporate interactive tasks for students, such as group work, comparative source analysis, and other innovative pedagogical approaches. Tünde Greksza (Széchenyi István High School , Sopron) for her works entitled Fascism in School – the Effect of the Anti-Jewish Laws in School Life, about discrimination in schools and Women Fates in the Shoah, which uses testimony to provide a female historical account of the Holocaust. Péter Molnár (Toldy Ferenc Gimnázium, Budapest) for his work focusing on close study of three testimonies—two of Holocaust survivors and one of a rescuer—to discuss moral dilemmas in history in details. Rescue out of Humanity. In their project they plan to incorporate the developed testimony-based lessons in a peer-guided travelling exhibition about rescuers during the Holocaust. "The testimonies provided a catarthic experience... as if survivors became our personal acquaintances... We had to find life stories, which are suitable for educational purposes and which also might result in similar catarthic feelings in students." "I learned a lot. If I did not have the certificate of the major prize in my hand now, it still would have been worth while for me to participate in this program. Aggression and prejudice are so widespread that I felt I should be here taking part." Full video and written components of the awarded lessons – including teachers’ guides and handouts for students– will be posted and made downloadable from the website of the Holocaust Memorial Center and the Hungarian portal of the Institute’s website in the near future. We would like to acknowledge the program’s donors: the Embassy of the United States, Budapest, Hungary and MÁV-Start Zrt, who provided the honoraria for the winners and covered the travel costs for participants of the project who live outside of Budapest. The Institute’s work in Hungary is made possible through the generous support of the George W. Schaeffer Family Foundation.